This blog entry about the events of Thursday, June 16, 2011 was originally posted on June 19, 2011. PART 1 (DAYS 1-3): “Do you think we’re going to hate each other in two weeks?” my newest travel companion, albeit longtime friend Cheryl asked me. She was referring to the epic coast-to-coast road trip we were about to embark on, from New York to San Francisco, one that we would spread out over a period of two weeks and change. No matter how long you’ve known someone, spending two weeks with anyone in a car could definitely take its toll on a friendship. I had known Cheryl for close to twenty years — since high school days — and over time we’ve developed this sibling-like relationship so platonic that one of us might introduce the other to a stranger as a close cousin. If you read the last Global Trip entry, you already know that her plan was to relocate from the east coast to the California Bay area to be with her boyfriend Andy, who had taken a job there. The two of them had living in Boston for about two years until a few months ago; he went to California early while Cheryl finished up a contract job. Eventually she packed up their Boston apartment and hired a moving company to transport their things, but the only thing pending was her car, which she had planned to drive over — with some company of course. Not surprisingly, Cheryl has not only been a good friend throughout the years, but a faithful Global Trip blog reader since the beginning. She’s followed this blog for years — and was even inspired to do her own three-month trip and blog through South America — and she was already starting to feel a little weird about actually becoming a “character” in the long-running “Trinidad Show” she’d come to know, with all the characters I’ve met along the way. “You know, you don’t have to write down everything,” she advised me. Blogging would be one element of our road trip, but more importantly, there was driving. Sure, I knew how to drive, but my skills in driving the manual stick shift of her car were a little rusty — and so we spent a Friday afternoon in Brooklyn trying to get me back up to speed. Cheryl refreshed my memory on shifting gears, and the clutch, and RPMs, etc. — all things I had a handle on in theory due to playing driving video games. “If you’re forced to do it, you learn,” she told me. “Just like [learning] Spanish,” I said. The only thing that video games didn’t teach me was footwork, which any beginner stick shifter knows can be a bit tricky, with the whole balancing act of the clutch and the gas pedal. We practiced this part in a parking lot near my home in Brooklyn, where I got into the swing of things, and without hitting anything either (unlike a video game). Despite a couple of engine stalls, I got the hang of it pretty quickly (it’s like riding a bike), so we stepped things up by driving on the highway: the Brooklyn-Queens Expressway. We picked up my bags and camp gear, through them in her 2007 Honda Civic coupe and head down south to Coney Island on that sunny Friday afternoon. I figured if this was going to be a true coast-to-coast trip from “sea to shining sea,” we should definitely start things off on the shores of the Atlantic Ocean. Highway driving is fairly easy — video game or not — for you simply shift up a gear every 10 mph of speed. Third gear in the 30’s mph, fourth in the 40’s, fifth in the 50’s. Same goes for downshifting. The only really tricky part of driving manual is when you’re in first gear, driving slow on side streets and in stop-and-go traffic — especially on inclines. Everything was going well with me driving down the B.Q.E. towards Coney Island — until the electronic voice from Cheryl’s GPS device told me to get off the highway (even though I thought we didn’t have to) and into a southern Brooklyn neighborhood with busy side streets and intersectons. Needless to say, I choked, and stalled the engine a couple of times again. “Want me to drive?” Cheryl asked. CONEY ISLAND HAS BEEN A NEW YORK INSTITUTION for over a hundred years. In its hey day in the early 20th century, it was the getaway destination for New York City folk, a beachfront collection of attractions along edge of where the city meets the Atlantic Ocean. For decades, Coney Island has seen it’s ups and downs, but today it has been revived with the rebooted Luna Park amusement park, with two new formidable small roller coasters to complement the historic wooden Cyclone nearby. 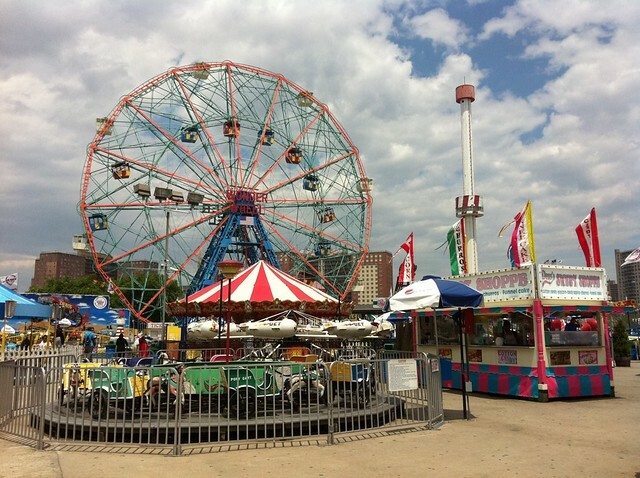 But Coney Island isn’t all rides; it is the home of the famous boardwalk, the original Nathan’s Famous hot dogs (where they also sell beer and even fried frog legs), the New York Aquarium, legendary freak sideshows, and MCU Park, the minor league baseball stadium for the Brooklyn Cyclones. I’ve accomplished most of Coney Island’s big to-dos over the years: riding the historic Cyclone, watching the annual Mermaid Parade, dipping in frigid New Year’s waters with the Coney Island Polar Bear Club, cheering on Kobayashi at Nathan’s annual hot dog eating contest (the year Joey Chestnut took it away from him), and even attending a free screening/cast reunion of the cult film The Warriors (where the climactic finale takes place in Coney Island). The one thing I hadn’t done in New York’s seaside playground is perhaps the most iconic: riding the famous and historic Wonder Wheel, the ferris wheel built in 1920 that serves as Coney Island’s centerpiece. “Swinging?” the ticket collector asked me. I was confused — was he really asking about my state of promiscuity? — but soon I realized there were two lines: one for for cabins that swung, one for cabins that just hung. “Uh, swinging,” I answered. He could have cared less. Cheryl and I boarded the swingers line and before we knew it, our ferris wheel cabin was high up in the air, then sliding forward down a small track so that it could sway back and forth — making our view of the Atlantic a rocking one — much to Cheryl’s chagrin. The newer thrill rides I’d save for a dedicated Coney Island trip at a later date, but for the time being the point of being there was to go to the beach and put my feet in the Atlantic, which was a lot cleaner than I remembered. Along the way, we noticed Zoltar, the animatronic fortune teller from the movie Big (which was actually shot in Rye Playland, a county-run amusement park about 20 miles north of New York City). We stopped and got our fortunes, both vocal and written. Cheryl’s vocal fortune didn’t cause her to become “big;” however my written fortune foretold I’d hit it big financially. “We’re getting a camping upgrade!” Cheryl exclaimed. Perhaps we would in fact come up with extra cash for extra amenities in the National Park campgrounds we’d stay in over the next coming weeks. “It’d be funny if it said, ‘Your parallel parking skills will improve,” I said. I DROVE US TO NEW JERSEY for the beginning of Cheryl’s last weekend, and it was on that drive that I really began mastering the stick shift in all gears (and neutral). We ran errands, got dinner with friends, and went to Campmor to pick up supplies. (There’s an actual store, for those of you who only know it as a catalog/website.) The rest of the weekend we spent apart in Jersey; we’d have plenty of time together over the next couple of weeks. We stayed at our respective parents’ houses and did our own things: she went a wedding while I went to an engagement party and a Father’s Day lunch. We regrouped on a Monday morning at the stupid o’clock time of 5:20 a.m. to continue our drive west — me taking the first driving shift. We had only gone literally around the corner of my parents’ block when I started getting rusty again. “It stalled,” Cheryl informed me. I guess Zoltar never gave us that non-stalling fortune because it wouldn’t have come true anyway. On the way back to Jersey, we hit a big traffic jam in Staten Island. “Only two more weeks of this,” Cheryl joked. I’m back behind the wheel in Western PA; no time to edit until later, so mind any typos. that is a horrible fortune from zoltar! Detour suggestion - the most fun you can have with your boots on - the Calgary Stampede!!! FYI that is an actual slogan. I’m not that clever.